Build a Mobile Center of Excellence to drive business-defined mobile policies, technologies, apps and skills. Scale for an order-of-magnitude rise in mobile application development and acquisition. Increase self-support and reduce employee demand for IT endpoint support. Make the mobile phone your primary office communications device. Make Wi-Fi the default networking technology for endpoint computing. 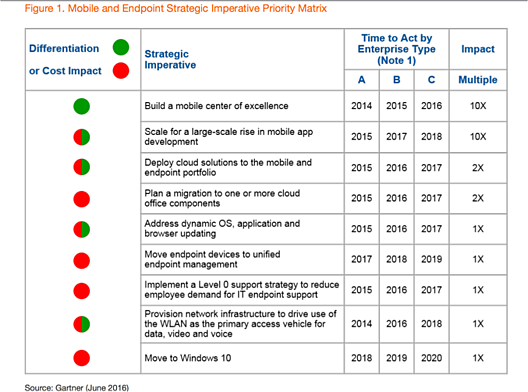 Gartner clients can download the full report here. To understand what a Mobile Center of Excellence is and if you need one, click here. To learn what citizen developers need in a mobile application development platform that can make them self-sufficient, click here.